Get the RIGHT dumpster size for YOUR disposal! for dumpster rental service for commercial and residential use! 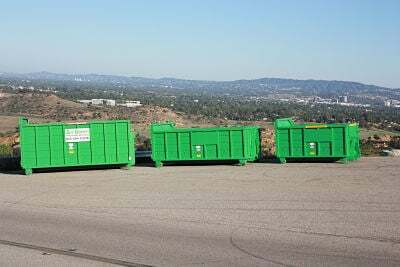 The Green Dumpster offers competitive pricing on all residential and commercial dumpsters. We have rental service in the San Fernando Valley and Los Angeles. Please see the full list of cities that we offer trash bin service in. If your city isn’t listed, please do not hesitate to contact us as our service areas are ever growing! We offer one-time service or periodic roll-off bins. The sizes we offer are: 3-cubic yard, 9-cubic yard, 10-cubic yard (coming soon! ), 16-cubic yard, 25-cubic yard, 40-cubic yard and 10-cubic yard. Whether you need to remove debris from an event, a demolition, or you may just be cleaning out the garage, we have a dumpster solution for you. Our dumpsters are clean and aesthetically pleasing, so you won’t have an eye sore in front of your home or business. Our wide range of dumpster sizes are perfect for lightweight construction, home clean outs, garage clean outs, yard waste and much more! You get to keep your bin for one week, but arrangements can be made if you want it for more or less time. At The Green Dumpster we pride ourselves on honesty and customer service. We are a locally owned and family run waste management dumpster rental service. If we don’t have the size you are looking for we would be happy to help you find someone who does! Please contact us to get a quote and schedule your roll-off dumpster rental today!